Hey People! PappaRazzi here. I'm the Grubster's pop and the name just worked out. I like. So it's my birthday (yay me!) but Momz is visiting the Gruberooni clan on a business trip, so I was sorely missing one my annual birthday wishes, the traditional PappaRazzi B-D breakfast. After my beautiful wife and family, one of the things I cherish most is my vintage Griswold cast-iron 9" griddle and this morning I am putting it to it's intended use. Over easy eggs on cheesy grits. Redneck Ambrosia. Grits and eggs, you say? Booooring? Oh no! Trust me, if this is what I have every year, like a condemned man's last meal. I assure you this recipe is Southern comfort food kicked into Heaven~ I reserve this easily varied recipe for the rare occasion as it's not exactly, how you say, heart healthy? If you follow along you may notice I am frying crumbled bacon in butter, but hey, my day my way, and no one to tell me different. Sheesh dry your skinny eyes, I drained it on some paper towels. And Doc? I promise to be good till next year ...I'll need to, after this one. Grubarazzi's classical kitchen home-schooling included knowing the value of quality, fresh ingredients, and more importantly how to discern those rare gourmet items that can make dishes PoP~! 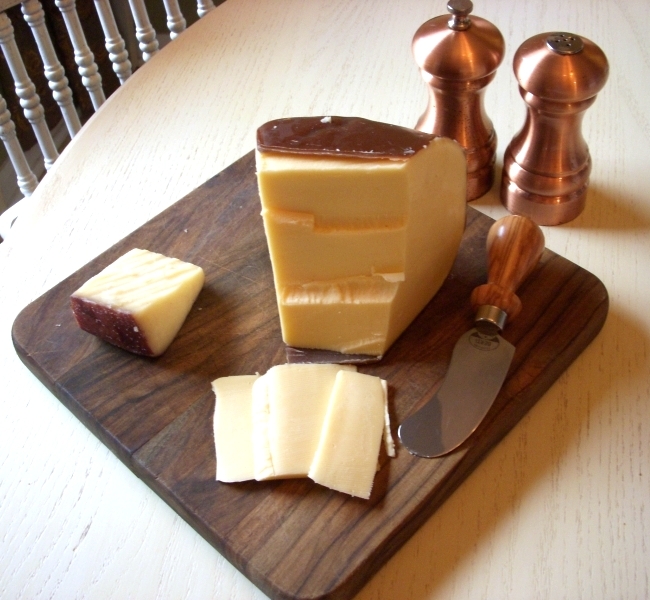 Todays item is Sartori BellaVitano Merlot cheese, an award winning Italian-like, Wisconsin USA masterpiece. The addition was spur of the moment as I had a small remnant begging from the cheese drawer, and the result was unexpected. They call it "Merlot" because the wine-soaked crust is eatable. The berry and plum notes along with the nutty white cheese with a firm almost Parmesan texture is great with crackers or crusty bread, and a favorite Pinot Noir. I think I may have found another pairing ...Bacon! The Sartori Merlot cheese is the gilding on this lily, so a little smoked gouda cheeses up my grits today. The recipe can obviously sport your choice of cheese, and I rarely make it the same way twice. So simple, even a processed bacon-smoked-cheddar can be very surprising, but this recipe is more about the construction and prep. Otherwise you end up with a bowl of homogenous glop, or dry chunks, but don't stress! It's grits an eggs y'all, chill. Make grits according to the package. The grit's consistency when complete is the real trick. Making this ordinary meal special is about layered textures. 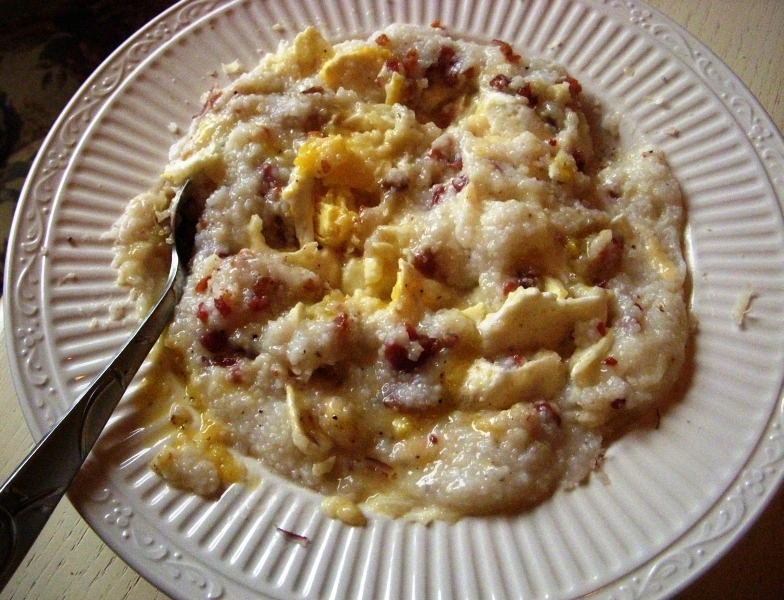 Just visualize peppery grits with swirly cheese and crispy bacon gettin it on with yolky eggs. Don't skip a dash of salt in the grit water, thinking there's plenty of sodium in this dish. You are correct, but grits without salt are insipidly bland and could make all that other sodium a total waste of good salt. I like my grits medium consistency, because when I chop in my over easy eggs and stir the liquid yolks into the swirly cheese it adds wetness. Too thick and it's just not happenin'. This is a dance, not a fist fight. Too runny, you have delicious yellow soup ...and regret. Next texture is *crisp* bacon. I was lazy today and used crumbled bacon-in-a-bag. Crisping crumbled already-cooked bacon is a trick. A trick requiring butter, otherwise it's just not making contact with the pan. Draining it on a paper towel will help you destress about fat grams. That also gives it a place to rest while you build the other parts of this dish, because while the bacon *will* go into the grits, it's a final step ...gotta stay crispy. Remember we're fighting yellow soup regret. 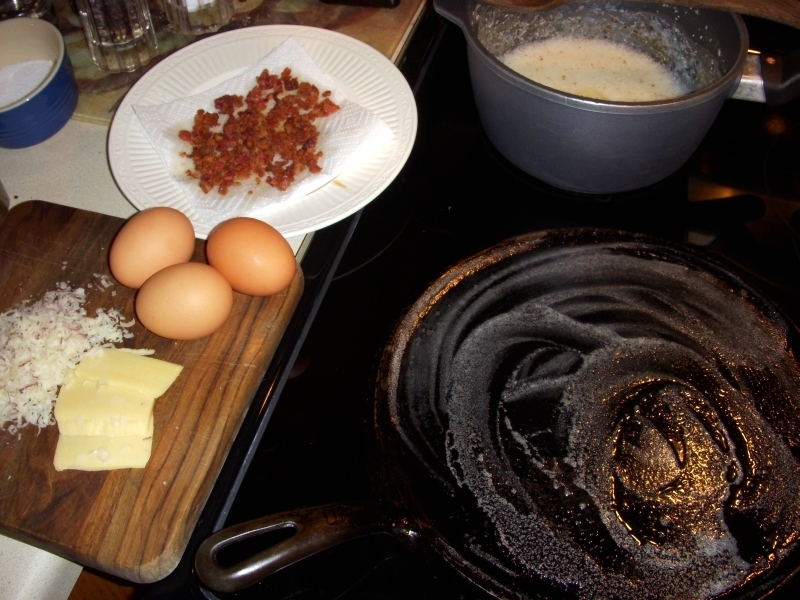 While the grits and bacon get right, grate a small pile of Satori Merlot cheese to top it all off. In the past, I've used Parmesean or whatever was in the fridge. While the grits are finishing, fry 2 eggs over easy/medium, it's just not a grit party without swirling cheese and liquidey egg yolks. If runny whites and yolks make you squeamish, cook them over-medium. With firm whites but liquid yolks, you will be happy as you discover the liquid yolks continue to cook somewhat in the hot grits and there won't be anything slimy, just velvety goodness. If you have the necessity to fry them until the yolks are fully cooked, this recipe is not for you. Make sure your other ingredients have come together in a bowl before the eggs are flipped ...we're seconds away and timing is key. Stir the gouda cheese into your grits and swirl so it just starts to melt ...you don't want the Gouda evenly blended, just coated with hot grits. Oh it's gonna melt, but quick load it into a bowl. Now dump the cripy bacon on top, no need to stir. You flipped your eggs 30-45 seconds ago, they are done, place atop the baconey shrine. Now you have a velvety mountain of cheesey grits, layered with cripsy bacon, topped with a couple soft yolkey eggs ...but wait. You forgot the Sartori Merlot grated cheese. When you grated it I hope you got plenty of the wine-soaked rind! Sprinkle on top. Grab a spoon, chop those eggs and swirl the broken yolks into a typhoon of high-sodium, high-cholesterol goodness. OMG~! I can't stop you from adding hot sauce or even salsa, but don't. This peasant dish, without substitutions, delivers a rare savory subtlety. The creamy smoked Gouda and rich eggs yolks dance, as the bacon and plummy Merlot rind of the BellaVitano fight over who is more delish. Who wins? Me! Why? Well it's my birthday, but not too many of you have a chuck of BellaVitano cheese in *your* fridge. It wasn't hard to find, just at my local upscale grocery cheese section. So, will I live to see another year? Hope so, because Sartori makes a Black Pepper BellaVitano too! Whoa-this definitely did take the boring out of grits and eggs. Lots of wonderful ingredients here. I would love to have this on my breakfast table. Great guest post Popz! What a nice guest post from Popz :) I'd make mine scrambled eggs, but know they'd be amazing over cheesy grits....mmmmmmm. Hiya Popz! What a GREAT guest post! You and I speak the same language - I LOVE grits with cheese and eggs all mixed in! There are definite advantages to being a Southerner! Happy Birthday! PappaRazzi! I love it! These are pretty sophisticated grits - or should they be renamed gritz? Isn't he adorable? I love my daddy. Amazing blog! Ɗо ƴoս havе any recoommendations for aspirimg writers? І'm hopiong to start mү oown site soopn but I'm a little lost οn everƴthing. overwhelmed .. Anny suggestions? Apprewciate іt!